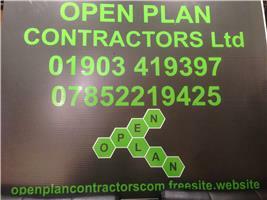 Open Plan Contractors Ltd - Builder based in Worthing, West Sussex. Here at Open Plan we specialise in loft conversions ,extensions and all structural works. We have over 20 years experience in the loft and structural trade where no job is to big or to small from complete site works to building a shed. We also offer a full building service from design all the way through to completion. We would like the opportunity to quote for your works and for you to see previous finished projects and talk to previous customers to see the high standard of finish and the experience they had with our team.